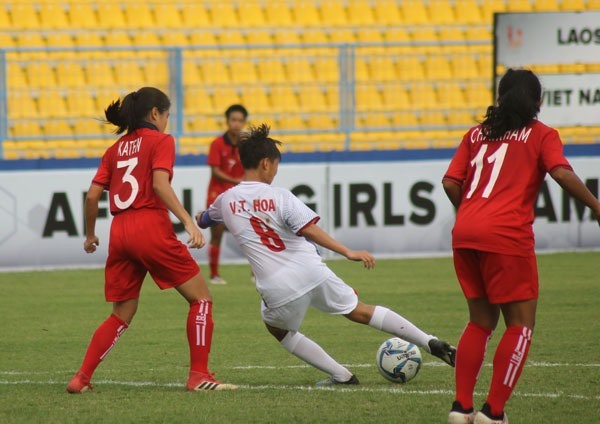 HÀ NỘI — Việt Nam won a bronze medal yesterday at the AFF U16 Girls’ Championship in Indonesia. The team beat Laos 3-0 in a penalty shootout after the two sides tied 0-0 during the official time. After their earlier loss against Thailand in the semi-final, Việt Nam recovered their spirit and entered this game with new energy. They controlled the game from the time the referee blew her whistle, however, they did not convert opportunities into goals during the two halves. In the penalty shootout, goalie Đào Thị Kiều Oanh shone, to help Việt Nam win the game after blocking three penalty shots by Lao players.